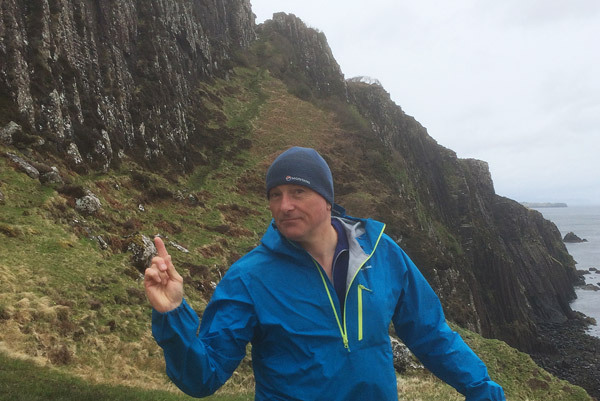 No 466 – The Skye Trail – Pt3 – The Outdoors Station "UA-92084833-1"
So on the Bank Holiday Monday we decided to crack on from Portree after a good days rest and hit the trail heading for The Storr via Ben Dearg. Although I had done some research on the route before we left, every piece I read spoke of talking the alternative coastal route which on reflection would have been (a) a walk with a view and (b) so much nicer and quicker underfoot. That stretch as you leave Portree is just boggy common ground. So it was heather bashing for hours before we even got the Ben Dearg. Plus we had 3 tall barbed wire fences to negotiate with no crossing places that we could see for half a kilometer either way. So even so there way a vague path marked on the map, nothing on the ground made for easy walking. As we got to Ben Dearg the weather once again became very poor. The cloud base was low and the wind picked up. There were occasional very brief views of the path or the cliff edge, but these were just fleeting as if the gusts of grey mist were just teasing us. One moment they were there, the next a wall of grey. Thank goodness for plotting the route on the GPS mapping system. So many times we just checked to make sure we were on track and found ourselves 100m from where we wanted to be and heading in the wrong direction. The Storr – Great view! When we finally made it to The Storr we were hours behind our expected progress. Visibility was even worse and when I post the video, it might give people an idea of just what horrendous conditions we faced. Hard to believe when you look at the glorious sunny post card views. Leaving the Storr we dropped once again before climbing and we were by now really feeling low on energy. Looking back at the map the whole day wasn’t more than 15km, however during those last few hours if felt like hitting the wall in a marathon. Naturally we were continually scanning the ground for possible anything which could be a camping spot. There seemed to be nothing but peat, water and stones all open to the direct force of the elements. At last somewhere to pitch! However as we dropped down from Creag A Lain a small level piece of grass presented itself, slightly sheltered from East and West by small embankments and we both agreed, that no matter what, it would do! So having started at 8.30 we pitched exhausted at 6pm. It was a gusty night however we both slept as well as we could and woke to a calm morning. However this wasn’t to last and once again the wind and rain picked up as the grey cloud isolated us once again in the mist. 10km later we found ourselves at the tourist car park by Bealach Ollasgairte where the track towards Flodigarry is much more defined and well trodden. Even there the weather had other ideas and we just didn’t see the magnificence of the rock formations and landscape around us at all. As the tourists all took their photos and then ran for a their nice dry cars, we continued on down a very steep muddy path before finally hitting the road at Flodigarry and glorious sunshine. The walk to the hostel dried us out and when we arrived, although they weren’t open for registration, we were offered tea and a shower, which made the wrold of difference. As luck would have it, we grabbed the last room and shared it with two others who we had met on the hill. There was plenty of good camping there too if we needed it. Once booked in all the gear was put into the drying room and very soon everything was clean and reasonably respectable once again. The last day was supposed to be an easy walk to the bothy. I was only 12 km or so and we were anticipating an easy run. Its up there, don’t look down – got it? Sadly as we stepped foot outside the hostel the past became a boggy mess and the wind and rain picked up, meaning we were once again in our waterproofs for the rest of the day. A few times we lost the path which meant close inspection of the GPS when you would least expect it. A few signs were pointed the wrong way and sometimes we felt as if we were walking through someones garden. Spot where the wire and the cliff meet? The final section from Port Gobhlaig became a battle against the elements. The wind picked up even more so as if the gods were challenging us to make it. Walking across the exposed farm land was hard enough, however once we reached the cliff path at Bun-ideain things really did get serious. We made the error (on reflection) of walking the cliff path with the fence on our left and the cliff on our right. It all started off so well, however the wind was really gusting by now which meant a few times we were both holding onto the wire and keeping our feet close to the base, as the ‘path’ had suddenly become fresh air. We needed to get over that fence, which was unusually high for a sheep enclosure. Thankfully at that moment a group of Dutch walkers helped us across and within a few metres we found that the path were were on had completely fallen away. The view from inside to where we thought we might camp! Finally we made it to the sanctuary that is Rubha Hunish and sat for a while in the bothy just getting our breath back. It had been a violent end to the walk as Rose was blown off her feet outside the bothy. The romantic idea of wild camping down on the lower section for the last night went out of the window. The appeal certainly had long gone. Which meant we just had a couple of hours walk to get to the road and flag down the afternoon bus, so we could get to Portree and hope that the ‘Angle of Portree’ could put us up for another night before we headed home. A great read Bob and Rose. Having been woken at 4.30 as too hot in bed, I negotiated the stairs, with the handrail on my right, made a cup of tea, climbed back up the steep incline, struggled to get back into bed, against the gentle breeze coming through my window and once I am revived, will endeavour to get back to sleep. Glad you too came through what looked like a very scary adventure. Really enjoy your blogs. Wish I was fit enough to do it! Take care. Busy time for you & Rose! Really enjoyed listening. TOUGH trip, brave & hardy. Hope the 2 young ‘uns were ok & got to safety. DESPICABLE of that ignorant & selfish group at the last bothy; they should be banned for life, individually publicly named & shamed.